9117 – Dr. Akshay Gadre + 4Yrs. After breakfast visit Kuensel Phodrang (Buddha Statue) a place for refreshing with a huge statue of Buddha on the top of the Kuensel Phodrang, National Memorial Chorten (Monument) & Folk Heritage Museum. Afternoon visit Sangaygang View Point, Changangkha Monastery, Takin Preserve Centre, the national animal of Bhutan can be seen here. In the evening visit Tashichho Dzong (Fortress of the Glorious Religion). Overnight stay at Thimphu. After breakfast drive to Punakha / Wangdue, On the way Stop at Dochu-La-Pass (3150 mts.) to view the higher Himalayas. Arrival at Punakha check in at hotel. After noon visit Punakha Dzong – built in 1637 by Zhabdrung Ngawang Namgyal. For many years until the time of the second king, it served as the seat of the Government. The Dzong was named Druk Pungthang Dechen Phodrang (Palace of Great Happiness). Punakha is still the winter residence of Je-Khenpo and King Jigme Dorji Wangchuck convened the first National Assembly here in 1952. After that take a short and easy hike to visit the Chhimi Lhakhang – The Temple, also known as “The Temple of Fertility” was built by Lama Drukpa Kuenley, “The Devine Mad Man”. Evening free for leisure. Overnight stay at Punakha / Wangdue. Exclusive Non-a/c vehicle for all transfers & sightseeing as per itinerary. Personal expenses such as laundry, telephone bills, bar bills, tips & gratuity, bottled water and cost for other activities such as rafting, rock climbing, paragliding, portage, etc. AC Vehicle supplement charges would be Rs. 500 per vehicle per day. The above-mentioned hotels will be confirmed as per the room availability. Otherwise we will confirm similar category hotel. We reserve the right to re-arrange itinerary to suit hotel availability without changing the total number of nights in each destination and without compromising with any services. Supplementary charges may be applicable during festival dates and other blackout dates in respective hotels. Hotels are very strict with the child policy. Please carry the age proof so that it can be produced when asked. Most of the rooms in all hotels at Bhutan are twin bedded rooms. Very limited rooms have king size bed. King size bedded rooms will be provided subject to availability only. If the same is unavailable we shall provide twin bedded rooms only. 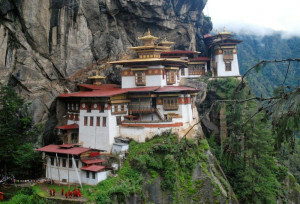 Due to less number of hotels available in similar category at Bhutan we provide combination of both 3-star premium and 4-star hotels under luxury package and combination of 4-star premium and 5-star hotels under premium package. Except selected 5-star hotels in Bhutan air-conditioned facility is not available in rooms. On request some of the hotels provide table fan only as per availability. Hotels in other cities of Bhutan may not match the standard of hotels in Thimphu, Paro & Punakha. Categories of Rooms in the packages are based on base category of rooms, unless specified. For tour Starting or ending from India Packages, we provide exclusive Indian Vehicle in India Part and Bhutan vehicle in Bhutan part. All the vehicles provided, unless otherwise specified will be Non-A/C Vehicles. Supplement Charges will be applicable for A/C vehicles. Indian nationals do not require any visa for Bhutan. A permit will be issued at the entry point on production of a passport (with a minimum validity of 6 months from the date of departure) or Voter ID (only valid document for issuing the Bhutan Entry permit). The traveler also has to carry photocopy of the travel documents and 04 passport size photographs. For Children, original Birth certificate in English and student ID is required. If you are entering Bhutan via land, it is to be noted that the permits are issued only during working days and hours. (Monday to Friday between 9 am to 4 pm during winter and 5 pm during summer). It is suggested that the travelers arriving in Phuentsholing on Friday should arrive latest by 10 AM in order to complete the entry formalities. No permits are issued on Saturday, Sunday and Bhutan government holidays. However, during high season depending upon the rush immigration may take long time to issue the permit. We shall not be responsible for any delay during processing of permit by the immigration authority. Please keep your client informed they may have to stand on long queue during high season to obtain the permit if traveling via Phuentsholing. Special Permit is required to visit places beyond Thimphu and Paro from, the Department of Immigration, Thimphu. No charges will be applicable for this permit. Please bring 02 passport size photographs and Voter ID card or Passport of each person including child. This special permit is given only after guest has entered Bhutan. Permits are not issued on Saturday, Sunday & Bhutan Govt. holidays.